Testing the limits of an nginx and PHP-FPM based WordPress Network with and without PHP APC opcode cache running on a really small KVM VPS. There were some discussions lately at LinkedIn mostly on the topic of choosing a VPS (virtual private server) over a shared hosting provides any benefits. My opinion: a VPS can clearly outnumber a shared host in performance and freedom, but not in pricing. Price can only be matched when the VPS is an unmanaged one, meaning you (or someone you hire) has to take care of all the configurations, the server management, the monitoring - even the operating system install itself. For most people this looks horrible and finding a cheap but good system operator is a nightmare for anybody. The problem is, that on a shared host you are limited to the system services. There are really few hosting providers how allow switching between web servers, or even switching PHP versions, and what’s worts: you clearly not allowed to tweak any of the services. I know there are really few WordPress users who want - and are able - to fine tune the backend of the install, but there are tiny things which can make incredible difference. I decided to make a little test to show how little is enough for, in this case a WordPress Network, to brutally gain on performace. Originally I wanted to show only the power of WP-FFPC1, a full page cache plugin written by me. The problem was that I left APC object cache plugin active, so I decided to show the importance of APC2 instead. The page I was testing is a category archive page. It shows 4 special post: all posts include numerous small pictures, some larger ones, loading jQuery with some extensions and listing some CSS files as well. It’s also a domain mapped sub-blog of the site. I have to add that I have a little trick made on my server config. Normally all sub-site content is server by PHP in a WordPress Network. 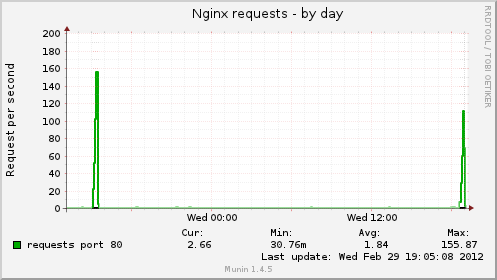 This was change by my when I added some extra into my nginx setup7. If this test had been done with the default WordPress Network setup, I’m fairly sure my result would be pretty awful, please take this into your count. nginx is a webserver, similar to apache2 (running behind most of the web pages on the world). The main differences: nginx is a lot harder to extend (for example, there are no possibilities to use files like .htaccess in apache), but it eats significantly less memory and CPU time in exchange. The web server can load the PHP compiler in various ways; apache2 server has a built-in module for it, which, unfortunately, can eat up all the possible memory. An other way is to use a “PHP server”, which can than be access with a protocoll, named FastCGI. PHP-FPM is a FastCGI server version of the PHP compiler. < href=“http://loadimpact.com”>loadimpact.com for making a stress test on my server. 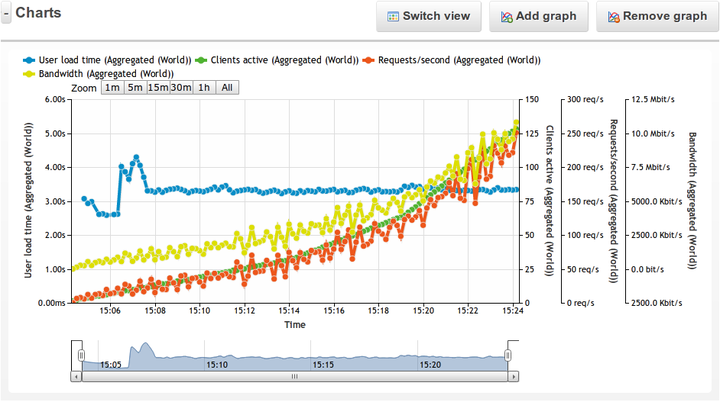 I have so low traffic on this very server that the stress test should make a clearly visible difference. The test setup: 20 minutes total runtime splitted into 5 minute parts. All parts have limited maximum simultaneous users. 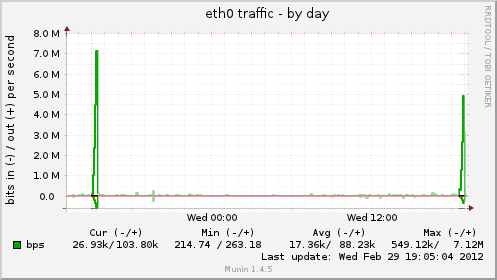 These are munin the graphs taken from the server while the tests were running. 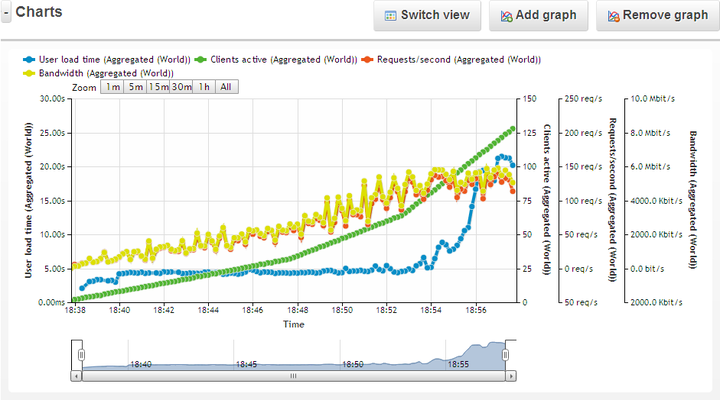 There are two highlited spikes, the first time was with APC on, the second (~1 day later) is without APC cache. Server has 4 CPUs, therefore 4 means the full utilization. The performance and the capacity of the smallest - and probably one of the cheapest KVM based virtual servers - suprised me again. It could handle 100 simultaneous connections per second without opcode cache! For calculation: if this would keep up for a day, it would result 8 640 000 hist on that day, which is way over a normal site’s traffic. For 14.40 £ (with taxes! ), this is the best buy ever. Aggregated 5 seconds page load time is not really a bad result, but the system could only handle it just for limited number of requests/second. With cache enabled the load time went down by 2 seconds, which is really much (~40%) and also, I could not reach the limit of the server. For calculation: keeping 220 requests/second rate for a day would result 19 008 000 hits per day, and the server is still serving all the content with the same speed. 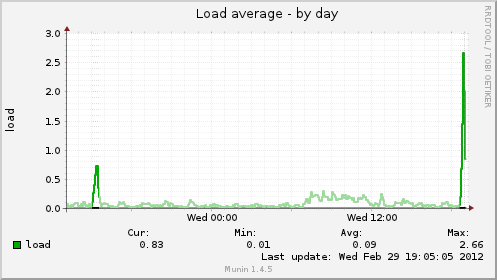 The munin graphs show another important thing: without cache, the server load can be measured at lest 3 times multiplied. 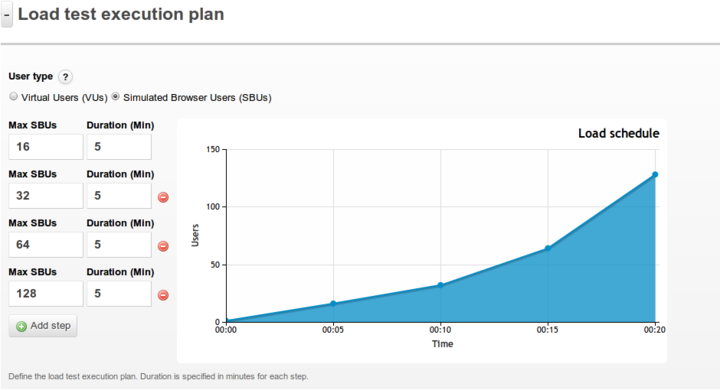 This also results that the ethernet traffic and the handled nginx requests per second will fall off.